This week I was busy making my girls and I some aprons. I liked the idea of making us something that all matched (Gracie is really into all of us matching) but not having them all look exactly the same. Today I’m sharing the tutorial for Gracie’s ruffled apron over at Riley Blake Designs and here I am sharing the pattern and tutorial for Ruth’s toddler style apron. As for mine…I can’t post a tutorial yet. After I finished up I realized it would be much cuter with a blue cherry pocket on the side so until that is finished we’ll just talk about the two girls aprons. 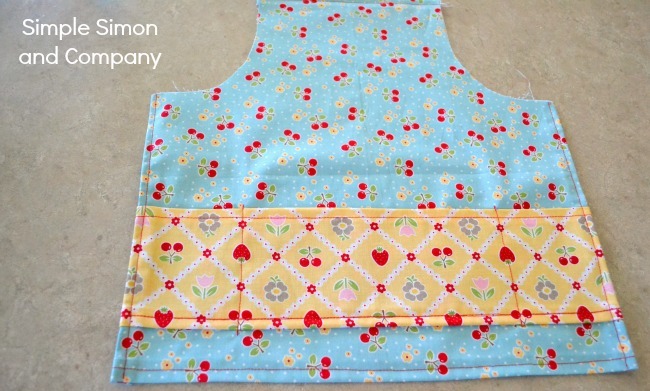 To print out the pattern for Ruth’s apron just scroll down to the end of this post and you will find the link. 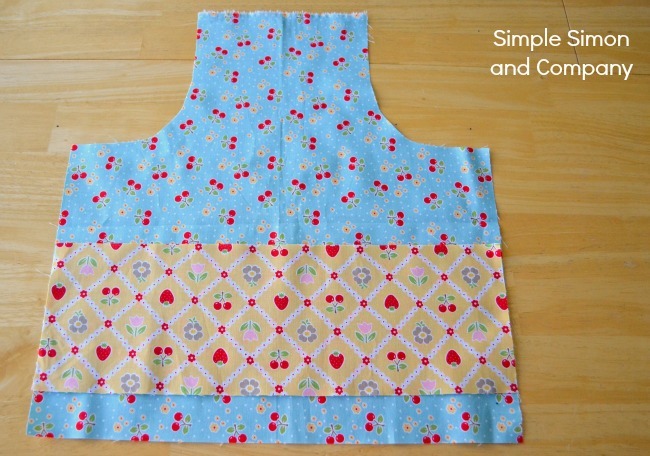 Once you have your pattern printed out cut out your apron and your pocket. 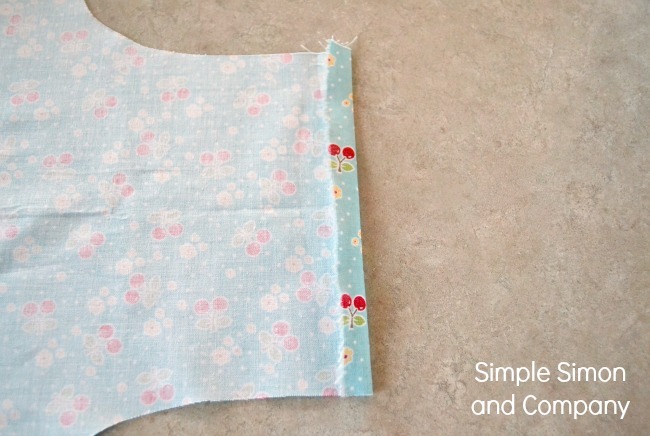 Now fold the top and bottom hem of your apron back 1/4 of an inch and iron. Next fold it back one more time iron and top stitch. Now repeat that same process on the top and bottom edges of your soon to be pocket. Next pin your pocket onto your apron about 2 inches from the bottom. 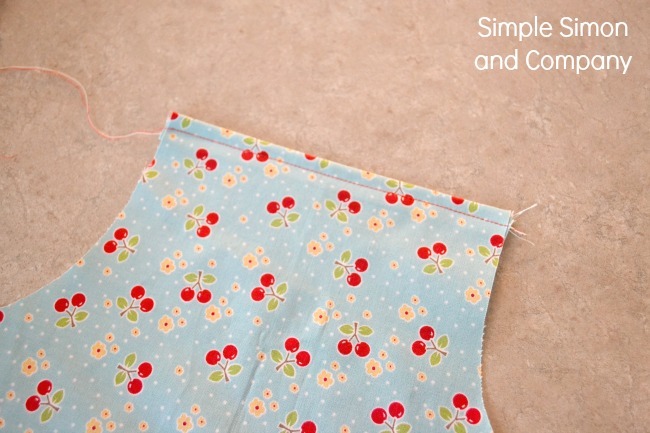 Sew along the top stitching line you made on the bottom of your pocket to attach the pocket piece to the apron. Now sew 2 straight lines from the bottom of your pocket to the top of your pocket. (Each of these lines should be between 3 and 4 inches in from the sides of your apron. And finally repeat the process that you followed on the top and bottom hems of the apron but this time do it to each side. All that is left to do now is to attach the ties. For this I used a package of red, double fold bias tape. 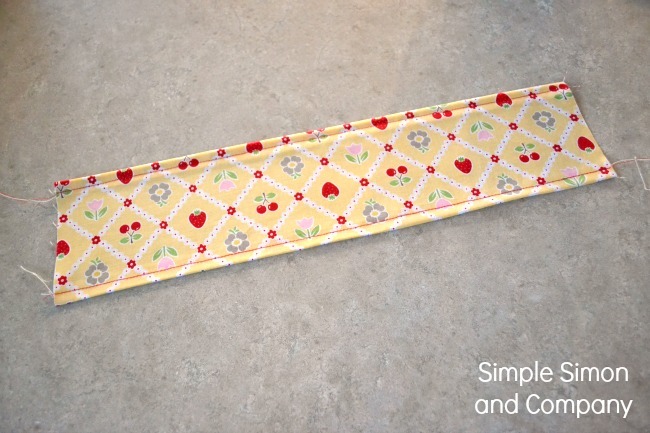 Put the middle of entire length of bias tape at the middle of the top of your apron. Then measure about 8 inches on each side of the bias tape middle and pin it to the top edges of your apron. Starting at the end of the bias tape sew the bias tape closed and continue sewing it together up around the arm holes, over the neck, down the other arm and off the end of the other side. It really is one of those 30 minute projects! Now…here is where I’d planned to show you some adorable photographs of me and my girls in our aprons. However…. …meanwhile I tried to take some photos of Grace by herself. And thought she was HILARIOUS. I realized that my vision of me with my domestic darlings was going to have to stay just that…a vision. Oh well, maybe we’ll try again when I redo my apron. 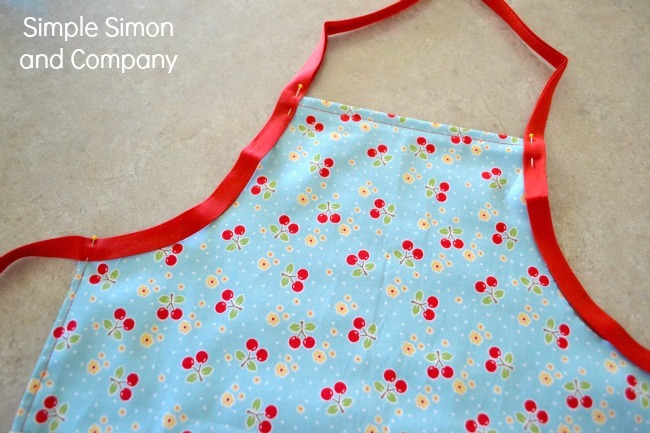 Until then you can make your own aprons…and send me the photos if they turn out better than mine. So, to make Gracie’s ruffled apron head on over to Riley Blake Designs for the full tutorial. Thanks for letting us…be part of your world! At least she didn’t say “Look! I’m Madonna.” I always love your “bad” photo shoots, they remind me of trying to take pictures of Wub. Oh, they just got better with each photo! Well, I laughed more with each photo! Really the first one was cute with the spoons over the eyes. Thank you for the laugh out loud this morning. I woke fine and within 10 minutes had acquired a wonderful migraine. That and I have two hours to run a bunch of errands in 95 degree heat that “feels like” 101 while my girls are in Vacation Bible School. I needed this! Oh, so cute! Love how they all go together, although I’m a huge mess in the kitchen, I would need the littlests style, ha. PS: your daughter IS hilarious! hahaha! i have a lot of “visions” too! Oh my these are so cute! 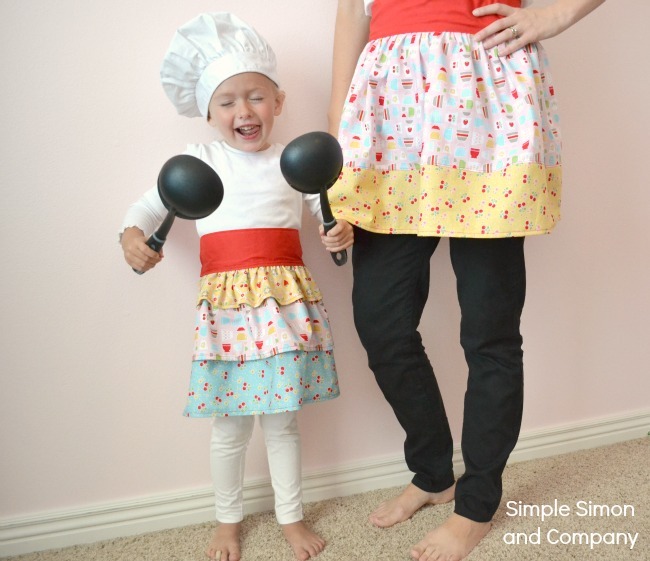 I just posted a ‘daddy and me’ matching aprons this morning– what are the chances? The Little Mermaid photo cracked me up! 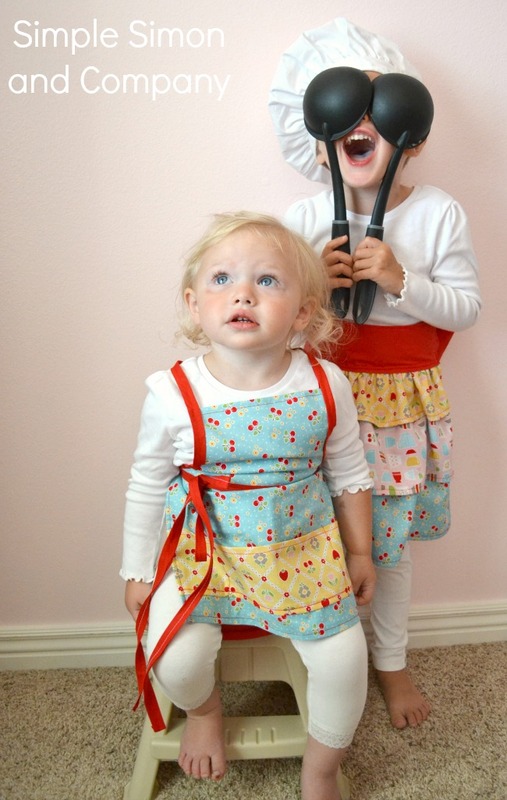 Precious aprons and little girls!! Your little Gracie is a hoot and steals the show!! Cute aprons too! 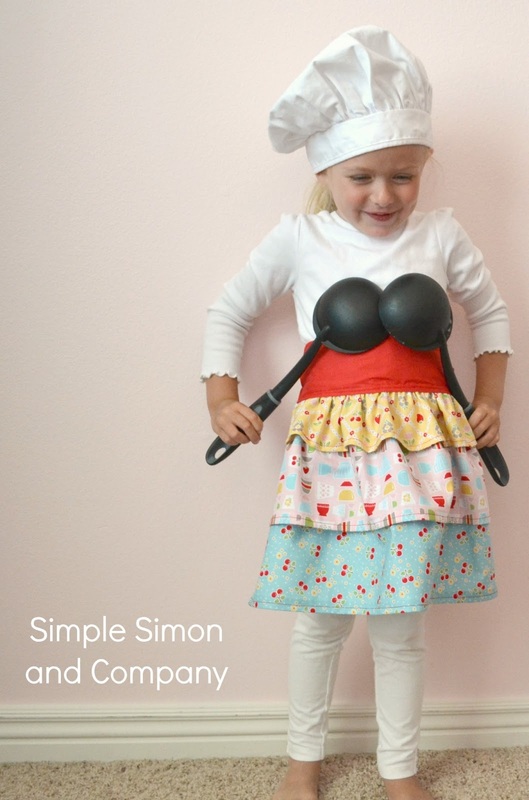 I can’t wait to make a toddler apron for my little cousin. Hope the link gets fixed soon! 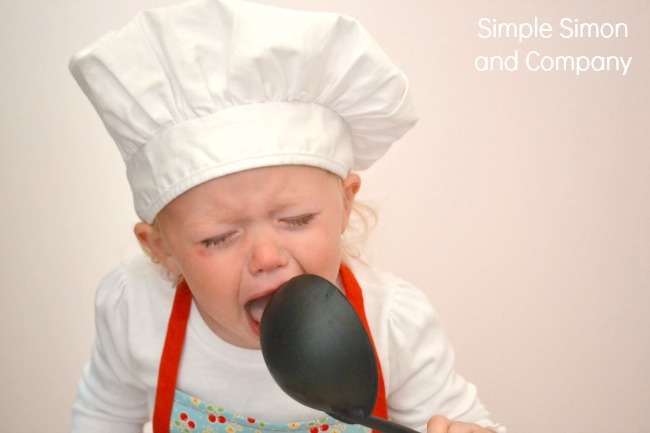 The melt down over not having the hat……I know that one all too well. My girls are about the same age and do the same things. The mermaid pic was hilarious. 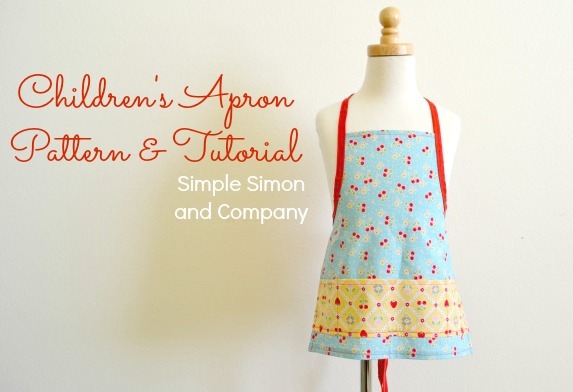 That being said, I can’t wait to print out the pattern and make my littles some aprons to wear while they help me in the kitchen. Thanks for the giggles and the tutorial. Thanks for e-mailing me the pattern! I made it using a vintage sheet as my fabric. Hey there, found your tutorial on Pinterest. 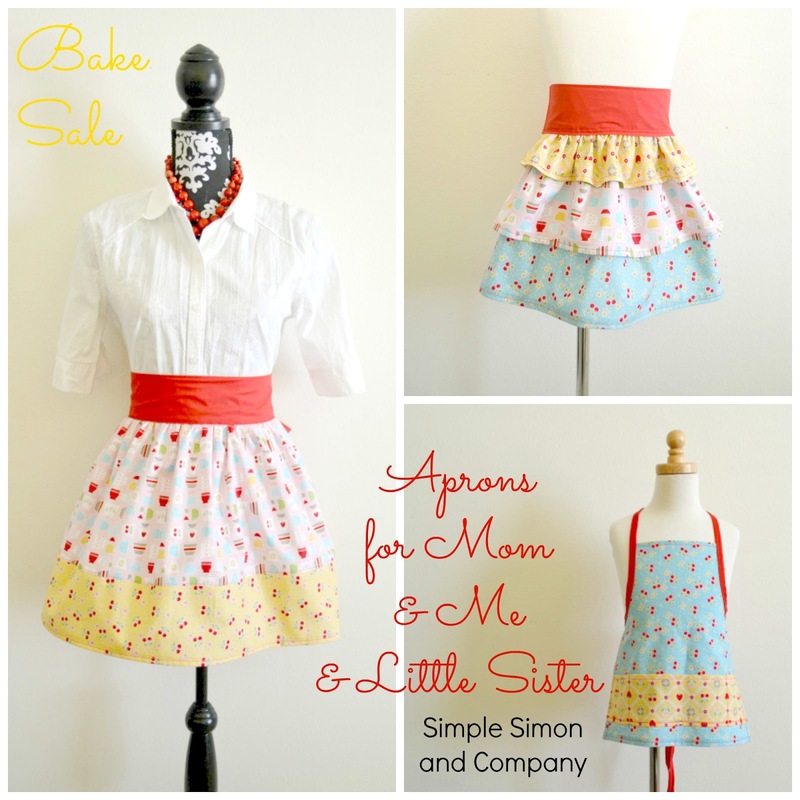 The aprons are absolutely adorable and seem so easy breezy. This may be a silly question, but how long is the bias tape you used? Your photos crack me up 🙂 I will reward myself if I could ever get my boys to take one fabulous picture ‘together’. Meanwhile my little toddler diva proclaims CHEEEEESE every time I whip out my camera. No idea where she gets it….